An unspoilt Spanish village two miles from the sea. Close to the busy fishing town of Palamos and the chic beach resort of Playa d'Aro (with marina). The house: 3 bedroomed villa accommodation on wooded hillside with pool, terrace and superb views over countryside to the south. Within 3kms of a wide range of shops, restaurants, swimming and tennis. There are several golf courses within twenty minutes. Car essential for all but fanatical walkers. Within easy reach of a sports and leisure club providing facilities for, tennis, fitness training and social activities - and more swimming. All furniture and equipment is new. 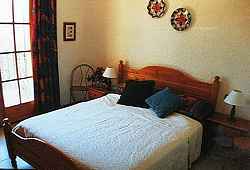 The bedrooms consist of one double with balcony, one en-suite twin (can make up as one) and one with two single bunks; two bathrooms in all. The kitchen has refrigerator (with freezing compartment), washing machine and microwave etc. 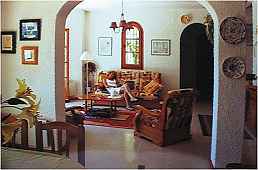 The sitting room with TV (Sky, BBC and Spanish channels) is equipped for 5-6 persons, and the dining area for six. There is a 24hr log burning stove, supplemented by electric radiators, for low and mid-season visitors. The villa is surrounded by garden, to the front colourful and behind, rough grass and trees. The pool is situated within the terrace to the front of the villa with a high level of privacy and superb views over wooded hills. There is patio furniture and on-site parking. 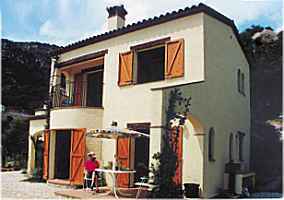 Location: midway between Palafrugell and San Feliu, three miles inland, close to the small town of Calonge. 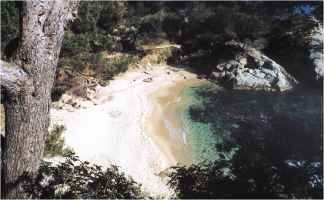 The nearest beach is at Sant Antoni (about 3 miles). There is a wide contrast of coast ranging from intimate coves to the fashionable shopping resort of Playa d'Aro and the bustling fishing town of Palamos, all within a fifteen minute range. Calella, Llafranc and Aigua Blava are only a little further. The region: close by there is a fast link road to the regional motorways, giving access to Barcelona (1 hr) and Girona (45 mins). There is a mainline station at Caldes (25 mins) with a frequent train service to both cities. For golfers there is a wide choice including the championship course at Caldes, and many less demanding courses within half an hour. For walkers and skiers the foothills of the Pyrenees are only an hour away with the resorts at about two hours. Electricity charged at cost in low season. Lettings begin from the first Saturday in each period. July & August £850 p.w. June & September £750 p.w. May & October £550 p.w. Weekly price is determined by the month in which each Saturday falls. Discount: £75 p.w. after seven days. Reservation advance: 20% of rent. Deposit: £200 payable with balance of rent 14 days prior to arrival. 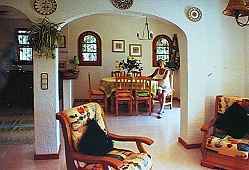 Location: midway between Palafrugell and San Feliu, three miles inland, close to the small town of Calonge. The house:consists of 3 bedrooms, two bathroom and large kitchen/dining/sitting area. All furniture and equipment is brand new. 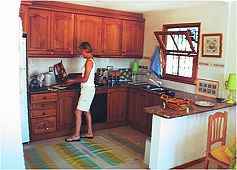 The kitchen has refrigerator (with freezing compartment), washing machine microwave etc. 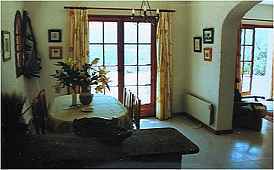 The sitting room is equipped for 5-6 persons, and the dining area for six. The villa is surrounded by garden, to the front colourful and behind rough grass and trees. It has a large terrace with a high level of privacy and superb views over wooded hills. There is patio furniture and on-site parking. 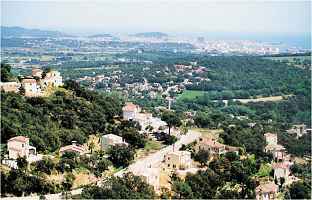 The locality: the nearby town is Calonge (2 miles) and the sea at Sant Antoni is about 3 miles. There is a sports/leisure club at the bottom of the hill where you can swim, play tennis as well as eat and drink. (1,250 mtrs). There is a wide contrast of coast ranging from intimate coves to the fashionable shopping resort of Playa d'Aro and the bustling fishing town of Palamos, all within a fifteen minute range.